Stumped on ideas for decorating your new door? We’ve got you. Your newly installed front door looks great on its own, but with Christmas around the corner, you may want to add a festive touch to your home. The question, with so few days left until Christmas, is how you want to decorate your front door. Christmas wreaths are a classic choice, but sometimes it’s fun to try something different. Other homeowners will cover their door in wrapping paper, but you want the style of your newly installed door to shine through, right? So what can you do that will help your door stand out this year and add some holiday cheer to your curb appeal? Here are some of our favorite suggestions. Wreaths are the default holiday door decoration for a reason, so if you want a classic with a twist, consider a different sort of wreath. A homemade Christmas wreath on your front door gives your curb appeal a touch of your unique character and personality, or your family’s character. Consider using something other than branches, even. A wreath made out of Christmas ball ornaments is fun and stylish, while a wreath made of white mesh or tulle can be an elegant representation of winter. Another way to play on the classic of a wreath is to make or buy multiple wreaths. A chain of three wreaths bound by a ribbon (or a scarf for added fun) maintains all the style of the old classic but puts a slightly different spin on it. Rather than covering your door in festive wrapping paper, make your door’s new, stylish finish the wrapping paper. Your front door can still look as pretty as a present with the added finish of a big red Christmas bow. Red velvet bows as door or wall decorations can be purchased at most stores that sell Christmas decorations and it’s the simplest way to add this effect to your door this year. For a full blown effect, however, consider a ribbon that runs from top to bottom of the door, and another that runs from side to side, with a big celebratory bow where the two ribbons meet. This bow can be in the center of your door or a little to the left, just for added flair. In decorating your front door for the holidays, you shouldn’t forget to add some festive touches to the spaces around the door. This will add to the cheerful ambiance and draw the eyes to the door, which should be the centerpiece of your exterior decorating. Adding a small potted Christmas tree, or even poinsettias, on either side of the door can add to the overall look. Wrapping tinsel around the door or around the slope of the porch roof, is something as classic as front door wreaths, but for just as good of a reason. If you have front steps, adding decorations to the railing or even the steps themselves will pull the eyes up towards the door. We hope you enjoy both the style and the quality of your newly installed door from The Door Store. 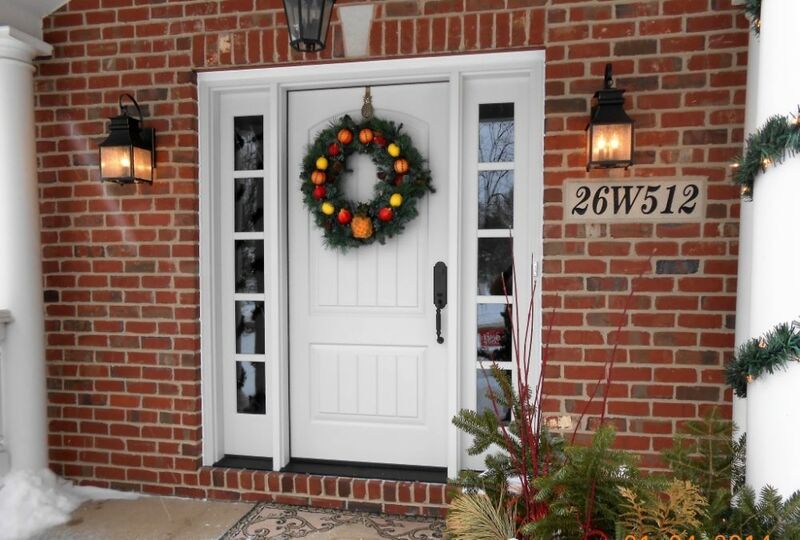 Now that Christmas is here, you can use decorations not just to fill your home and curb with the holiday spirit, but to enhance the elegance of your new door. If, however, you’re in need of a new door installation in Naperville, Illinois, there’s no need to wait until spring. Our expert installation team will have your new door up and providing tight insulation and quality curb appeal to your home in no time. Call us at (630) 495-0100 or contact us online for a free quote.